Bill McKibben is an unlikely warrior. Softly spoken, laid back in demeanour, long and lanky, slightly stooped in stature. Not exactly the fiery motivational speaker his role as founder of 350.org might suggest. As much as he loved being there, talking to the room full of people at Paddington Town Hall in Sydney last month, he said he was a writer, an introvert, who would much rather be at home at his desk typing – only half joking, you suspect. And yet, this innocuous-looking man has given rise to one of the most powerful financial movements in history – ­ divestment from coal. It was just 18 months ago when the financial press and the Prime Minister in Australia joined in belittling the Australian National University for divesting itself of a mere $16 million held in a bunch of questionable mining companies. Within six months the critics were obliged to eat their words. This movement had taken off and was starting to rocket around the world. Early last month Hunter Hall and Australian Ethical said they would both divest from fossil fuels. A few days later Norway’s sovereign wealth fund – the world’s biggest – confirmed it had gone through with its plans to sell out of 52 fossil fuel related companies. Coal is in a death spiral. And that’s not the greenies talking – it’s the capital markets, the investors who don’t listen to ideology or politics, but just follow the money. The Financial Times said on 8 May this year, “the Dow Jones US Coal Index is down 93 per cent over five years, compared to a 43 per cent rise in the Dow Jones Industrial Average over the same period”. “This is not an argument, this is a fight,” McKibben told his audience. Not on this side, he said. The radicals are the people wrecking the planet. Companies such as Exxon and BP, determined to squeeze another 10-15 years of fossil fuel production while they can [and before the government of the people throws them into jail for genocide – our dramatics here, not McKibben’s]. Exxon knew about its impact on climate change at least in 1977, it’s been revealed. 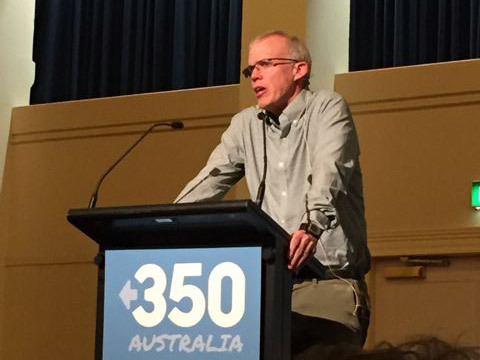 Introduced by the inimitable Blair Palese, founder of 350.org in Australia, McKibben summed up some of the horrors up of climate change already apparent, before moving onto some compelling causes for optimism. “Australia was one of the few developed nations in the world who signed the agreement [to keep warming to 1.5 degrees] and came back and continued with business as usual. “There’s no getting around it that we hold this meeting tonight in the very dark shadow of what’s happened on the Great Barrier Reef in the last three weeks. What we need, said McKibben, is to make climate change an election issue, “asking hard things, and whether they’re taking fossil fuel money. “We need pollution free politics. “At Paris they promised to limit warming to 1.5 degrees. We broke through that barrier in February. “The story of the last 25 years is that climate pinched harder than we thought,” he said. There were many causes, of course, but also a lot of academic work to show the influx of millions of people into the cities because of drought put huge stresses on the population. “Are they climate refugees? And they harbingers of what we can expect now that everything is in motion? But believe it or not there is good news, too, McKibben said. Costs of solar power have fallen 80 per cent in the last 10 years. Germany, which you can argue cause more than their share of the problem, is now offering the biggest solutions. “They adopted solar with a vengeance. Last summer they generated three quarters of their energy from solar. No one ever went to Germany for their summer vacation. McKibben said it took him a while but he figured out that this was not an argument, it was a battle. And it needed to be waged with money and power. “Exxon made more money last year than all the money in the history of money. “It would have to be passion movement,” he realised. This movement started with just seven undergraduates in 2008, average age 17. They divided up the world into seven roughly equal portions. One took America, one Europe, Blair Palese started the movement in Australia. Before long this tiny bunch of people had grown into the mass movement seen today. Humans change slowly, he said, but we don’t have that time scale available. One massive challenge was stopping the Keystone pipeline intended to connect the tar sands of Alberta in Canada with Texas. The consensus said the pipeline would be impossible to stop. In homage to the young who needed to keep their reputations untarnished for future work prospects, McKibben proposed it would be the older people who put themselves up for “cannon fodder” (arrest). It took about three months of action then Barack Obama said maybe we should consider this a bit more, McKibben said. “That was good but the real value of the fight was that we could stand up to the fossil fuel industry. In New York State fracking was stopped. That’s spread to Wales and France, he said. Last summer Shell had plans to drill for oil in the melting Arctic (in a demonstration of cognitive dissonance on a colossal scale). “It comes as a surprise to me but often when we fight, we win. What we often fail to remember is that the money never stops; never sleeps; never gives up. And there are billions and billions of dollars behind fossil fuels. Much of that money is invested by people who have given their life savings over to mutual funds and other money managers to try and ensure a reasonable retirement. We should watch what happens when these funds pull their money out of fossil fuels. Where do they now put it? I hope it’s not in the Public private partnership transportation groups who have brilliantly scammed taxpayers all over the world to build MORE toll ways — and produce MORE greenhouse emissions — and pay double junk bond rates.